This blogpost was first published at the UCL website during British Science Week, March 18th 2015. This week is British Science Week and last week the EPSRC held its ‘science for a successful nation’ conference. This made me reflect on the use of scientific methods in building performance research, which is essential for us to understand and improve the buildings we design, build, operate, transform and live in. 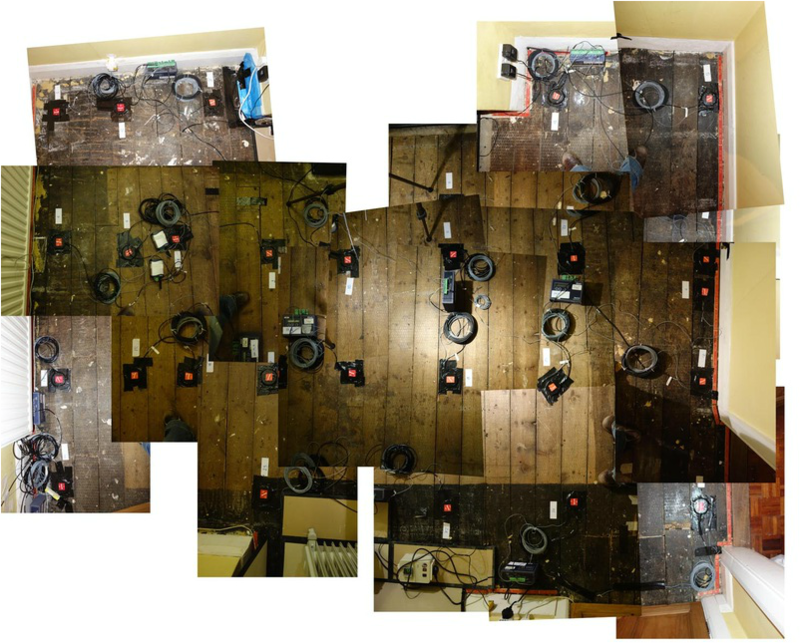 My PhD research set out to characterise the thermal performance of pre-1919 suspended timber ground floors, the heat-loss reduction potential of insulating floors and what the unintended consequences of doing so might be. Given the regular enquiries I get from both government policy makers, industry (architects, engineers, insulation manufacturers, installers), community groups and individual home owners, I note that I am not the only one eager to know the answers to this. There is a general desire to know: “what is the current floor heat-loss?”, “how does it compare to models?”, “what is the energy reduction potential of interventions” and “can we safely insulate floors without risking the structure or health of occupants”? These are big and important questions yet have no easy answers. My research required me to take a detailed and rigorous approach to understanding this problem, and only part of the work can be fully elucidated in a relatively short PhD time frame (2-3 years). These constraints are particularly relevant because of the likelihood that heat-loss patterns and any unintended consequences of the possible intervention measures can only be fully understood over the long term. So while I am both excited about some of my research findings and about the wider interest in my work, I am also aware that, rather than being able to answer these questions with clear, simple answers, I might be forced to conclude that ‘things are more complicated than we’d like’. 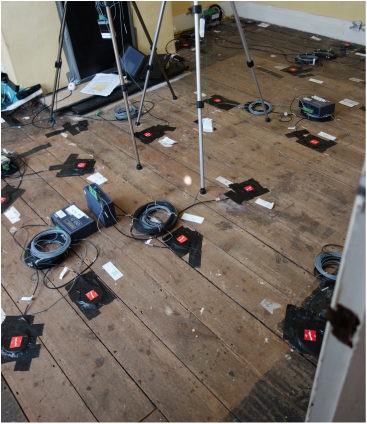 before I could characterise heat-loss from suspended timber floors, I needed to design, develop and test research methods which can robustly characterise heat-loss from such floors. So I spent a lot of time doing this before I could ‘get going’. Likewise with regards to the design of experiments, analysis of data and so on. a limited timescale. By this I not only refer to my PhD timescale, but also that measuring heat-loss usually is limited to heating-season only, drastically condensing field-data collection and intervention study potential. I am now in the final stages of analysis and I am starting to write-up my PhD thesis and I realise that it would be easy to lose sight of the scientific nature of my investigation in the quest to provide pressing answers to policy-makers, industry and other stakeholders. What do my findings mean if they are based on a small sample? What insights may be applied to the wider UK housing stock? This can only be answered by more research and longer monitoring in a larger sample. So I hope that my research findings, when published in due course, will not be seen as the ‘final say’ on the subject, but will highlight the uncertainty around research of this nature and that more work and longer and larger studies (i.e. in more houses) are required to confirm or re-adjust the initial findings. I hope that my initial research will encourage and support more scientific enquiry in this area so that we can continue to investigate these important questions. There are also wider lessons in this work for the building industry in general: there is no such thing as ‘high quality quick research’ or ‘quick accurate answers’. While the industry needs to respond swiftly to new legislation and initial research findings (and therefore needs answers quickly), we need to be careful to not draw more meaning from initial research or anecdotal findings than there is, because this can lead to misinformed decision-making or the idea that we already know the answers and no further work is therefore necessary. Instead, we need a lot more scientific research, acknowledging that this takes time and resources to help us truly understand how we can test building performance in order to confidently test our buildings to understand and improve building design and performance. In doing so, we support a legacy of better buildings with lower pollution, increased occupant thermal comfort and economic benefit while also being advantageous to the climate and improved national health. Mid-March (2014) is here and that means one thing: spring is almost here and external temperatures are rising, reducing space-heat demand. As I am measuring in-situ heat loss through suspended timber ground floors, my main PhD field work this winter is coming to an end. 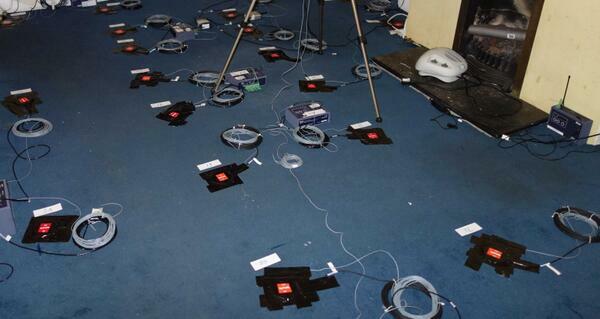 This means the removal of lots of equipment on top of the floor; in the room and in the floor void. Though the kind owner has agreed for me to leave some Relative Humidity and temperature sensors in the floor void. 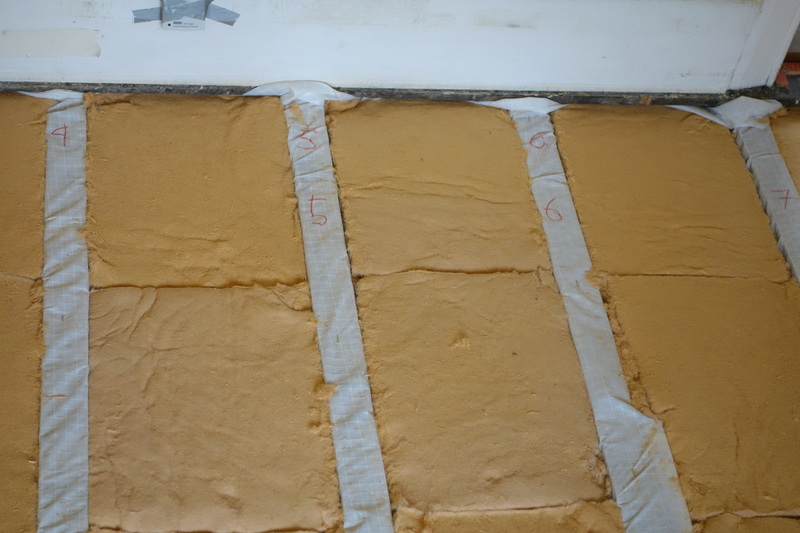 This allows the void condition to be monitored over seasons now the floor has been insulated with Pavaflex Woodfibre insulation, suspended in a breather membrane (insulation kindly donated by NBT). 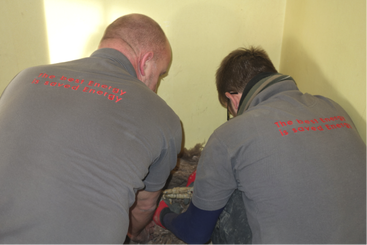 The guys at Downs Energy sponsored the installation of two insulation measures, including the final lagging of the pipes in the void (and there are many of them!) and installing the woodfibre insulation. 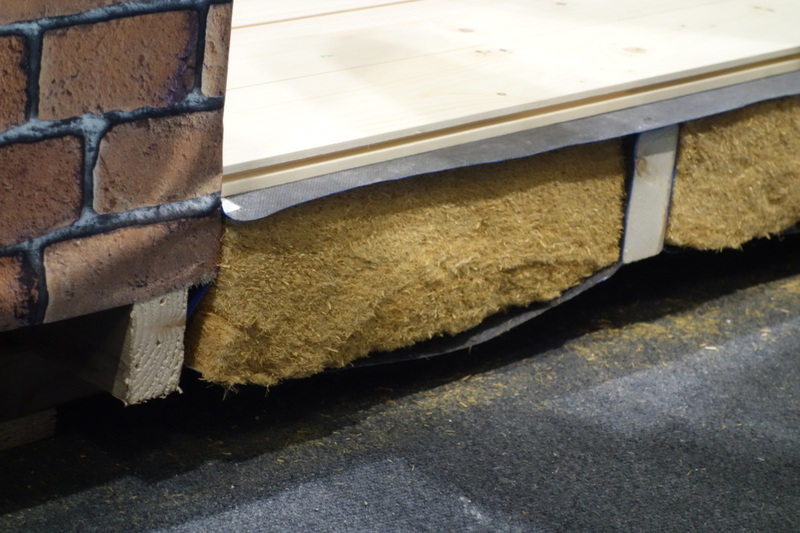 Using a mineral wool or sheepswool is easier to install, particularly given that the woodfibre batts need to be cut to fit between the irregularly centred joists. We swiftly found that cutting along the length of the batts to fit the width was too time consuming and left a lot of dust and loose fibres; while we had less material loss cutting along the width. This did give more smaller pieces to work with, so care had to be taken to ensure joints were tightly packed to avoid air gaps (see image on right). The woodfibre (k=0.038 W/mK) is a nice, dense material and - so I am told - is made from timber waste. It also allows tighter fitting between the joists. Below are some pictures of my PhD research stages, including of the high-resolution monitoring I am doing and the woodfibre installation. 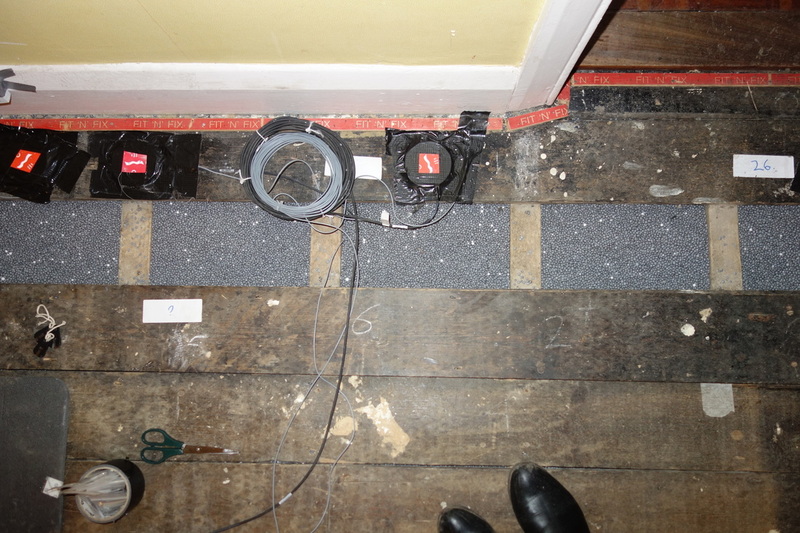 Stage 1 - measuring floor void conditions and heat loss on carpet (+ underlay) in late December 2013. Unclear whether meaningful results due to data loss over the holidays - the 'joys' of fieldwork! Stage 3 - Floor insulated with EPS beads, intervention sponsored entirely by Downs Energy. They did this intervention with my instruments in place. Look at that large 'bag'! Gives you an idea of quantity of beads to be installed and removed. 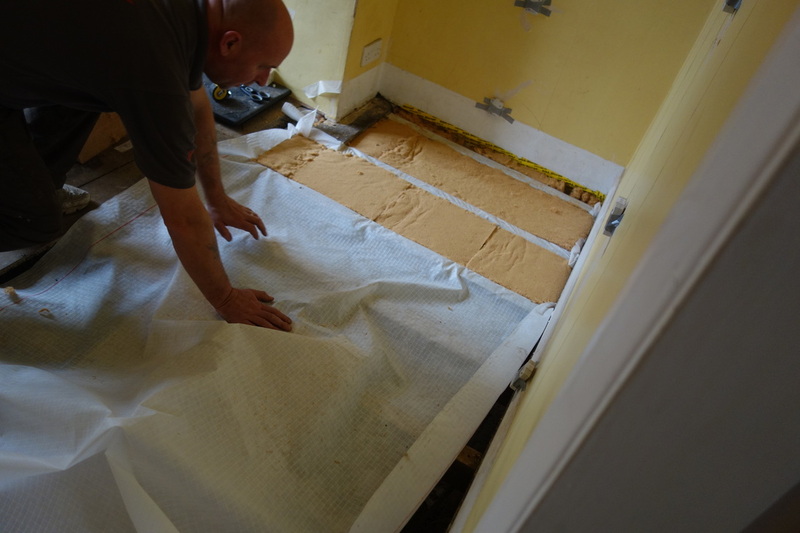 Stage 4: final intervention: installation of NBT donated woodfibre insulation in a breather membrane. Installation was done very generously by the guys at Downs Energy. As you can see, for this intervention all my instruments had to be removed. Stage 4 - Process: We wrapped the breather membrane over and under joists and stapled along the joist edges. I have a lot of instruments under the insulation and had to design in retrieval of my kit at the end of the monitoring period. Stage 4 - Process: you can see here cutting of the woodfibre in width. 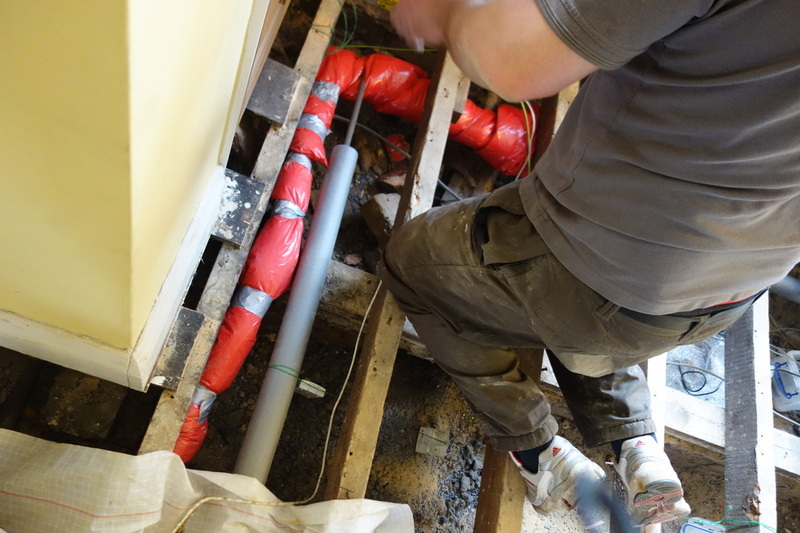 Downs Energy worked in sections, determined by the width of the breather membrane, and replaced floorboards as each section was done to allow for a safe working environment. Stage 4- Lagging of pipes. Too many pipes in floor voids - and many uninsulated radiator pipes, although in this floor, the radiator pipes had been sleeved with a thin felt at some stage. Stage 4 - retaining airflow in the void. Downs Energy brought roof ventilation 'lapvents' which we installed in front of the airbricks. 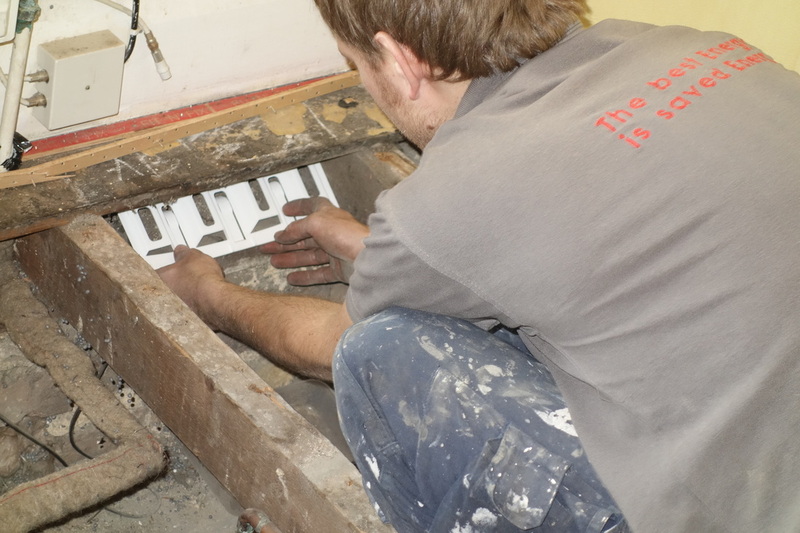 In this case, airbricks sit right under the floorboard in between joists. Airbrick extender sleeves were tricky so were not used here (there is a joist partly in front of an airbrick in this floor for example). My airflow measurements right in front of the airbricks in the void suggest that airflow is going through these lapvents. Having the airbrick in between joists means the insulation had to be tapered; exactly where there is greater heat loss; along edges/near airbricks) , there will be reduced ventilation. Stage 4 - instrument set-up. After insulation, I had to reinstall all the kit again on top of the floor; and with the final intervention, also in the void; which Downs Energy let me do on a section by section basis during the install. This spring and summer I will have lots of data to analyse and I am also planning to do a 'side-by-side calibration' of our instruments at the UCL Thermal Lab. Meanwhile, I will continue to monitor several (un)insulated floor voids for seasonal Relative Humidity to better understand void conditions and potential unintended consequences of insulating floors. Thank you again to Downs Energy, NBT and Geoffrey Stevens EST for lending of additional equipment; and ofcourse to the homeowner who trusted me with his property, and without whom this research could not have taken place. 2013: So, my PhD research: what is it all about? There are around 4.7 million dwellings in England built pre-1919 (DCLG, 2013b), predominantly constructed with solid walls and suspended timber ground floors (Rock, 2013, p101). It is considered that floors will need to be insulated alongside other fabric interventions (Gentry, 2010, Rock, 2013, p15) to meet the UK Government’s overall emission reduction targets of 80% from 1990 levels by 2050 (Crown, 2008). Yet it is currently unknown what the actual heat-loss is of such floors; how much they contribute to a dwelling’s heat-loss, nor what the actual heat-loss reduction potential is of interventions. My PhD research aims to gain an understanding of the predicted and actual heat-loss through un-insulated suspended timber ground floors and the heat-loss reduction impact of different intervention measures, alongside any unintended consequences of such interventions. 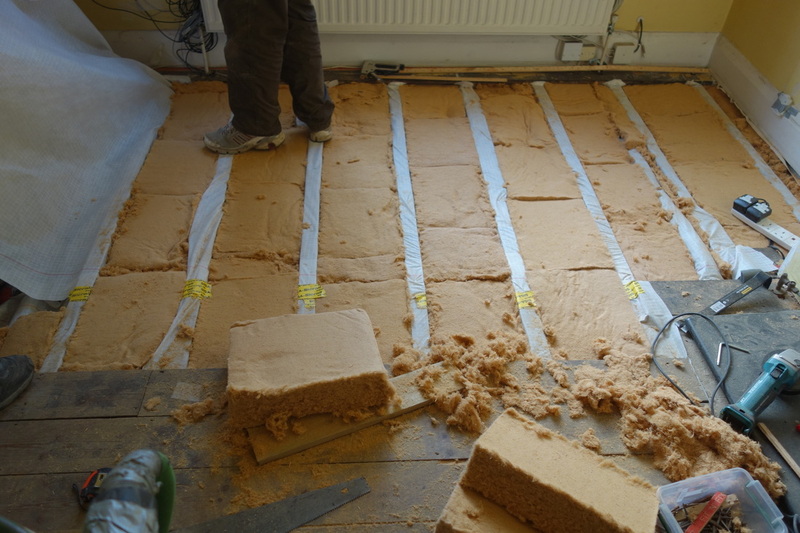 Last year I undertook a pilot study, looking at heat-loss reduction measures and floor void conditions of both insulated and uninsulated floors. At the University of Salford, with Richard Fitton, I also measured heat-loss through floors at high resolution in their Energy House, a thermal lab. These initial insights (which I have yet to publish) lead me to undertake high resolution monitoring of floor heat-loss in a real house in West London this winter, as well as monitoring of floor void conditions before and after floor insulation interventions. Monitoring in-situ heat-loss at high resolution in a real house in West London. So far the winter weather has been unpredictably windy and fairly warm and very wet: not ideal conditions to measure heatloss in suspended floors or monitor typical floor void conditions, but I will leave the challenges of this and field work in general for another blog post. However, the first floor intervention has just taken place thanks to Paul and Chris at Downs Energy who installed it and with whom I am testing a less disruptive way of insulating these floors. The first intervention is the use of polystyrene beads, which will remain in place for the next 2-3 weeks while heatloss and the void condition are being monitored. 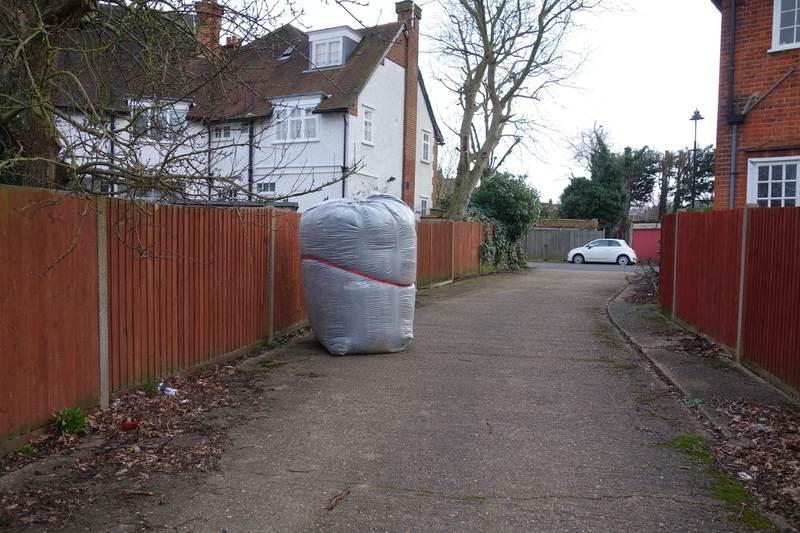 This intervention will then be removed by Downs Energy and another intervention will take place with material generously donated by NBT but installed by Downs Energy. I have been extremely fortunate and could not be doing this work without the generous donations from Downs Energy and NBT. But also, the work couldn't be done without an unoccupied home being made available by a very generous homeowner, who contacted me through the STBA. You can see from the pictures you cannot do this kind of ‘high resolution’ research with people living there!. I also found a ‘control’ house for the duration of the research and a ‘roaming’ heatloss monitoring kit is measuring heatloss in neighbouring houses at lower resolution, all due to my leafleting efforts one cold Saturday afternoon and a very active local community interested and dedicated in making their houses more energy efficient. The equipment I am using is mostly owned by the UCL Energy Institute’s LoLo CDT, but some of it also belongs to our sister department at the Bartlett Graduate School (such as the Infra Red Camera, Blower door kit and some Tinytags). As I am measuring at high resolution, the EST also kindly lent me half their stock of Eltek data loggers and Huseflux heat flux sensors, which were also used for the EST/DECC Solid Wall trials, in return for sharing of my results and data. I am mostly using Tempcon (RH and temp) Hobo sensors and Eltek dataloggers and they have been amazing delivering stuff with short notice as well as in the case of Eltek, coming to site to help me rewire and adjust some kit in the floor void that was not quite doing what I wanted it to do. Then there are my PhD supervisors at UCL and Sam Stamp, Jez Wingfield, Virginia Gori and Federico Calboli and others who have been supporting, advising, assisting and visiting site (and in Jenny Love’s case bringing food supplies! ), which has kept me sane. Team effort I call that. Another 6-8 weeks to go! DCLG. 2013. English Housing Survey: Statistical data set - Energy inefficient dwellings. DA7101: energy performance - dwellings, 2011 [Online]. Department for Communities and Local Government. Available: https://http://www.gov.uk/government/statistical-data-sets/energy-inefficient-dwellings [Accessed Sept 2013]. GENTRY, M. S. D. S. M. S. A. 2010. English Heritage Scoping Study Final Report v1. In: EH (ed.). Unpublished. ROCK, I. A. 2013. Home Insulation manual - How to cut energy bills and make your home warm and comfortable, UK Haynes Publishing.